Anyone with a toddler will know how difficult it can be to meet with an adult friend and ACTUALLY FINISH A SENTENCE, let alone have a conversation. My new tactic is to convince said friend that they REALLY want to go to something child friendly – this time was Sensational Butterflies at the Natural History Museum (NHM). The butterfly house from the outside – mind the mud! 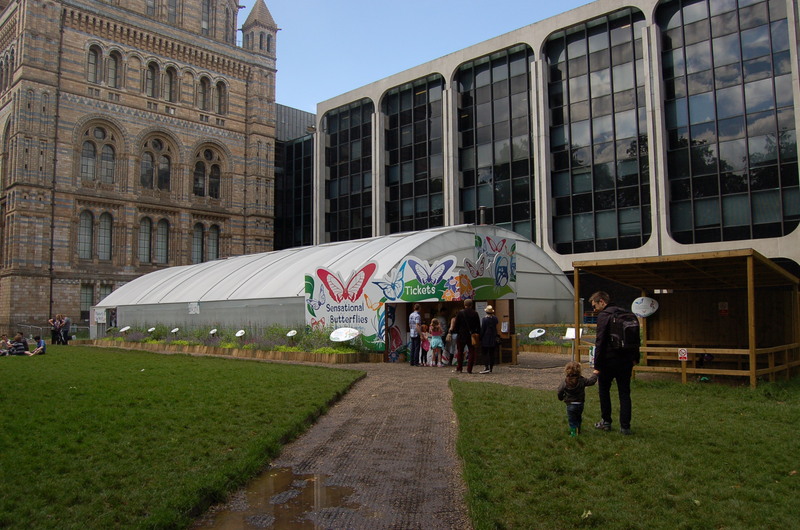 ‘Sensational Butterflies’ is an annual summer exhibition, held on the East Lawn of the NHM. As the entrance and ticket desk is outside, you don’t have to enter the museum at all to visit – so can skip any lengthy entrance queues. We also picked a school day to visit – there were lots of groups of kids milling around, but still less busy than the weekend. When the toddler had a screaming fit and insisted on wearing his wellies for this trip, I was convinced it was ‘terrible two’ behaviour. I now know that he possesses psychic powers, certainly when it comes to ground water levels. Despite the nice weather, it was extremely boggy, so the footwear was a well considered choice. 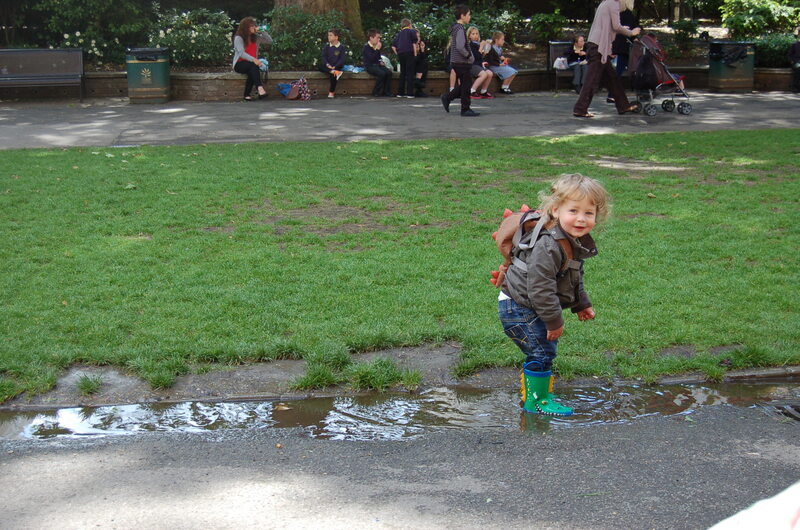 The toddler ran around the grounds chasing pigeons and jumping in large muddy puddles. Getting the buggy through the mire to the entrance without getting my sandal-clad feet wet was no small achievement! Buggies are not allowed in the enclosure due to limited space – there is a covered buggy park outside. 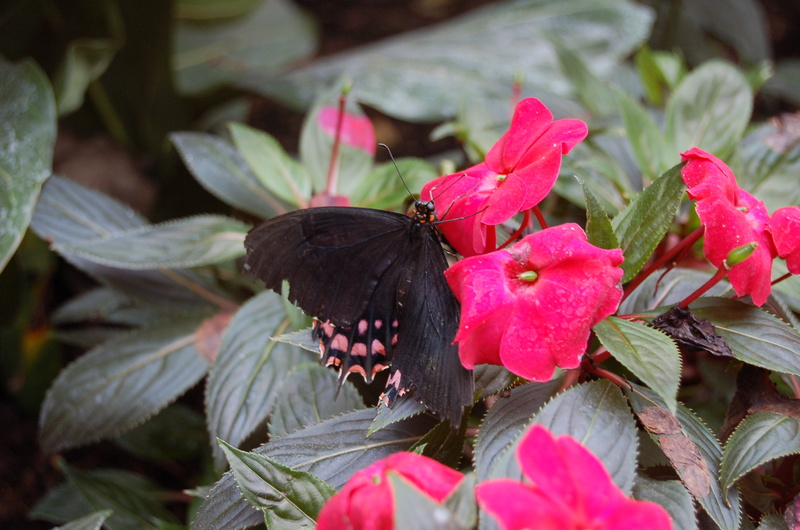 Although outside it was in the low twenties, inside the enclosure was extremely warm and humid – perfect for tropical butterflies, less so for pregnant mums. I’d advise to make sure you and your little ones are wearing as little as possible, and carry some water. 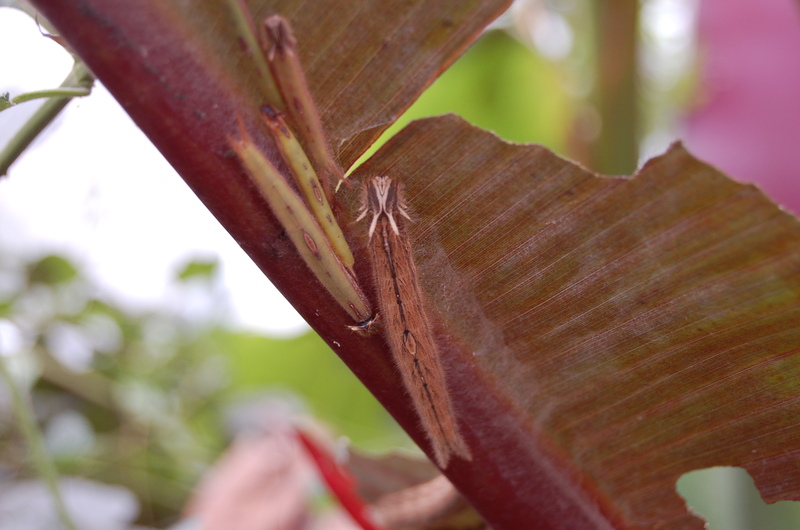 Over 30 species of tropical butterflies and moths are free-flying thoughout the exhibition. 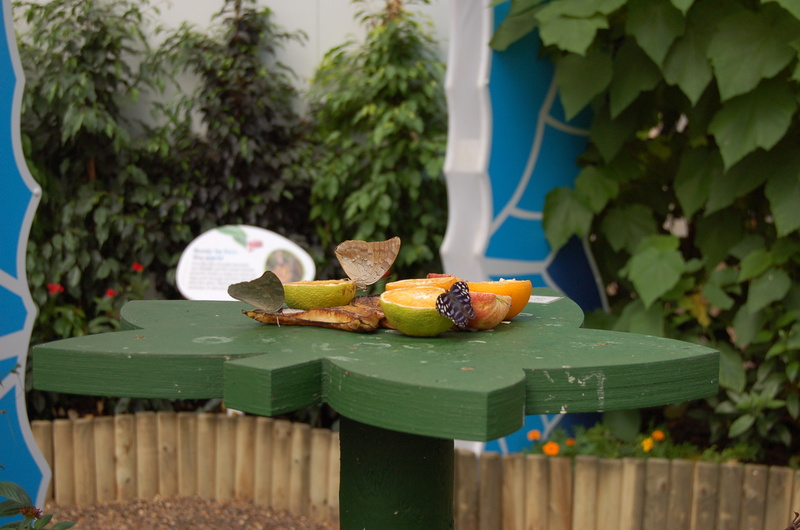 The toddler was delighted to see all the ‘wutter-fly’ – his favourite word at the moment is ‘more’, and he certainly got his wishes met – there were butterflies and moths galore! In fact, near the end he was starting to get just a little freaked out by so many butterflies darting towards his head! This is not a space to rush through – my friend commented how the butterfly house looked larger from the outside (now dubbed the ‘anti-tardis’). But with a path winding through beautiful foliage and planting, and some benches, it is a lovely place to stop and take time to look more closely at the wildlife around you. Rushing through you’ll definitely miss things – a very eager expert showed us where some owl moth caterpillar were busy demolishing a leaf. The toddler seemed less impressed with the ‘rilla’ than us grown ups. 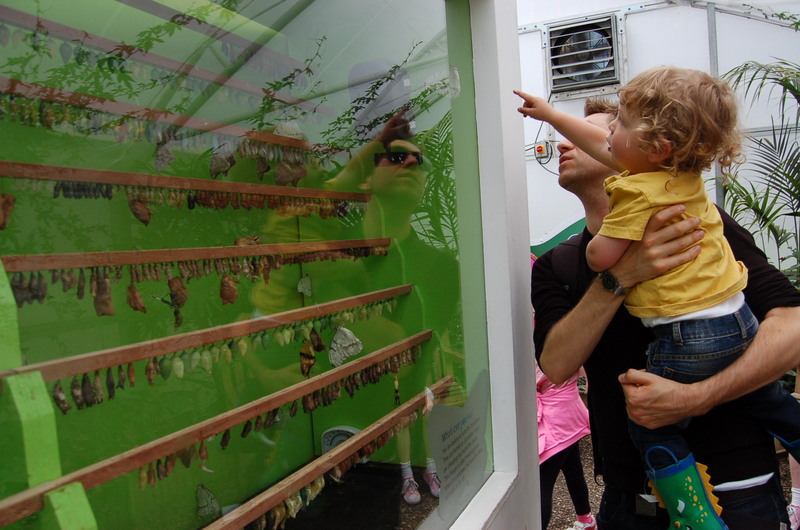 There is also a hatchery window where you can watch see rows of pupae – watch for those shaking when the butterfly is emerging! A stepping stool would have been helpful to avoid having to lift the little one. If you have older, less wriggly children, they could try what I saw one young visitor doing – she was sat perfectly still on a bench and proudly announced that this was the sixth butterfly that had landed on her! 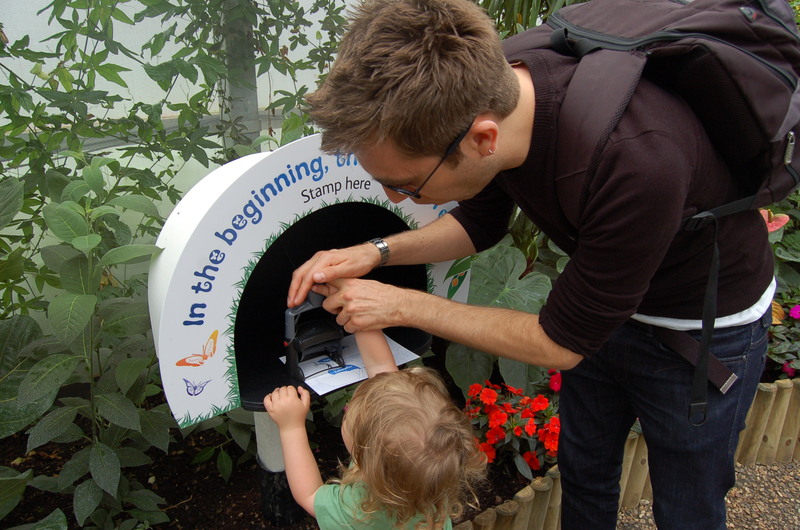 With your ticket, you are handed a card with spaces to collect stamps showing the different life stages of a butterfly. The toddler certainly enjoyed playing with the stamps, but they were an awkward height and of a design where they require adult assistance. Even with this, he managed to get ink all over himself, and after seeing how long his hands were stained for, I think it may not wash out of his top! 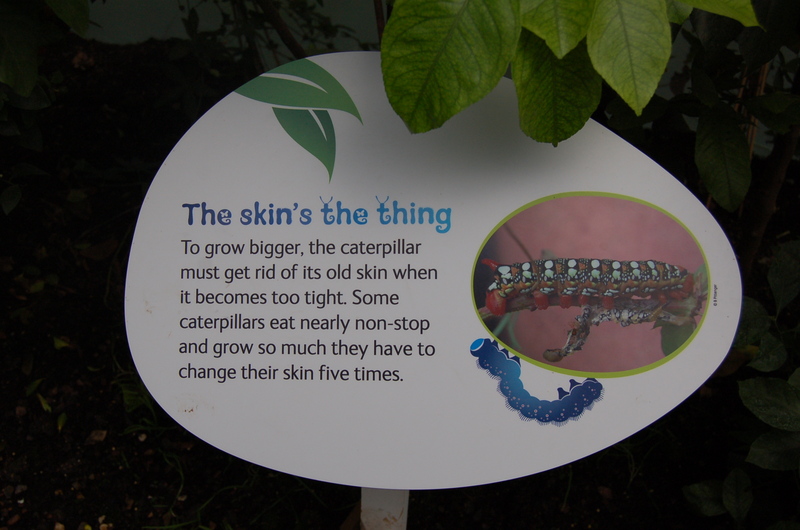 There are short informative text panels which tell you more facts about butterflies along the route – aimed at children, but us adults definitely learnt things from them! 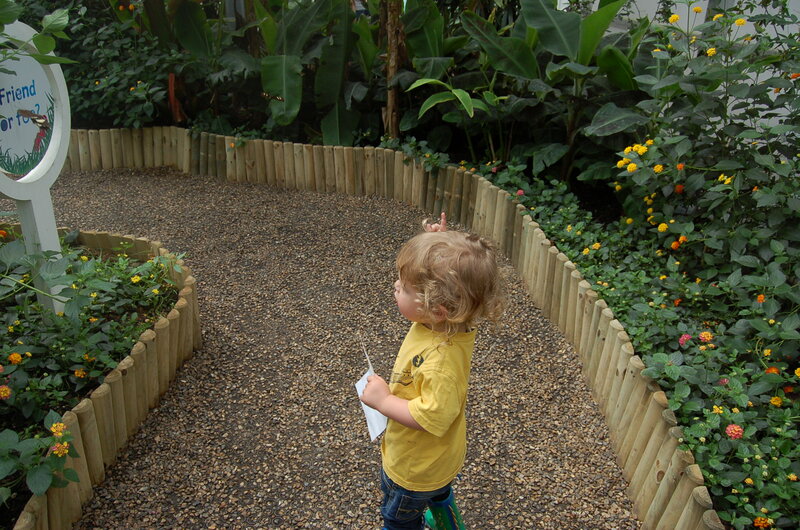 All in all we spent a delightful 40 minutes or so in the space – the perfect length for a toddler’s attention span. Most importantly, the adult conversation test was passed – I managed to have a proper catch up with friend enjoying lunch in the grounds (even if it did involve digging the toddler out from behind the ice-cream van a couple of times ). I would definitely consider a repeat visit as long as a) it was a week day b) it was in term time c) it was not too hot outside! 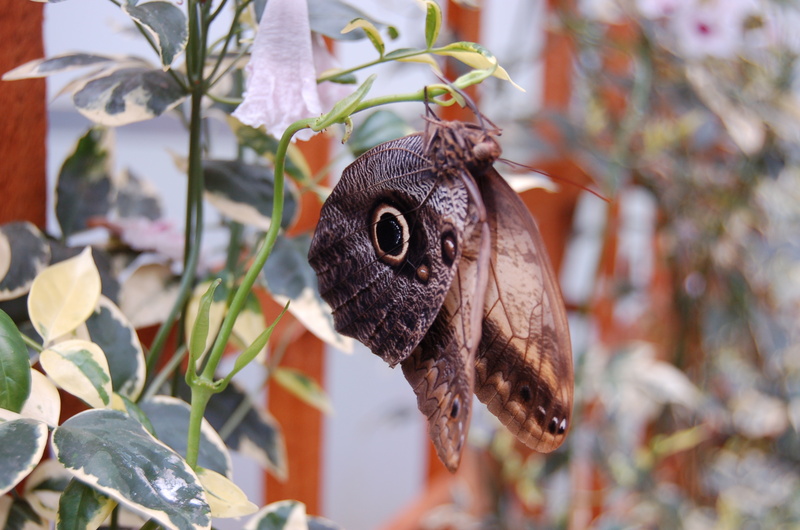 According to staff, it gets very busy at weekends and holidays – and when last year’s heatwave reached 30 degrees, it was a rather scary 45 degrees in the butterfly house. Whatever the weather, just don’t forget the wellies! *It’s rotting fruit and nectar, clearly. NB – These prices include a voluntary donation. FREE for children (3 or under), members, patrons, Museums Association members. Booking: We just showed up, but if planning to go on a busy day, you can book online with a minimum of 3 hours notice. £1.50 booking fee per transaction. Recommended length of visit: I’d say 40 minutes or so. Buggy accessible? : There is a ramp from Exhibition Road to the East Lawn, and level access to the exhibition but buggies must be left in the buggy park outside the butterfly house. See baby changing and toilet notes for buggy access to museum. Baby changing: Only available inside the museum – see comments in ‘Toddler time from gallery to toilets’ below. We used those just off the Great Hall – which involves negotiating steps via the main entrance. I’m sad to say they are the worst changing facilities I’ve used so far. There are three changing stations – two without straps, and one with a strap that doesn’t work. The stations are built into a deep worksurface, so the toddler decided to undo the strap, and run around the bench repeatedly. It took numerous attempts to wrestle him down to finally get his nappy changed. 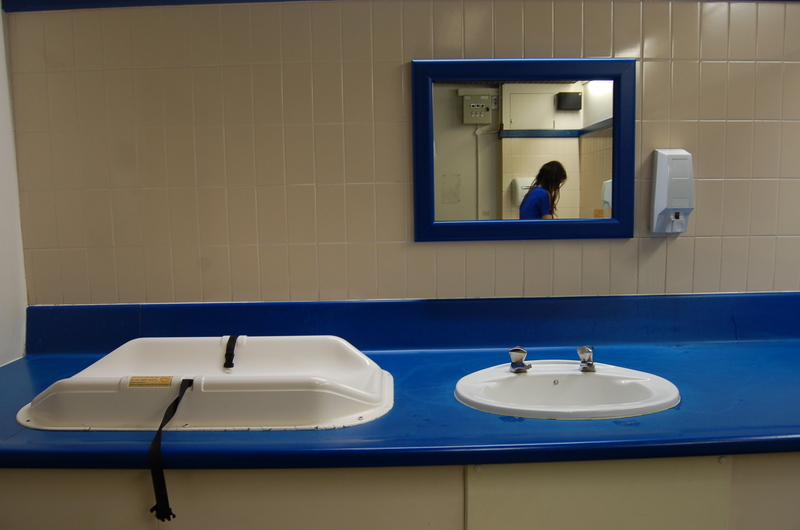 Then the soap dispensers were set on the wall, and as the worksurface was so deep I couldn’t reach them with the bump! (*gets slightly stressed thinking about it*). There is a single fold-down baby change in the disabled toilet on the side entrance (Exhibition Road), which does not involve steps or scarily deep benches. Breastfeeding friendly? : It’s so hot inside the butterfly house, and with only a couple of benches I wouldn’t want to feed here. There is however a breastfeeding room inside the museum, just off the Great Hall – the first I’ve seen so far in my travels. 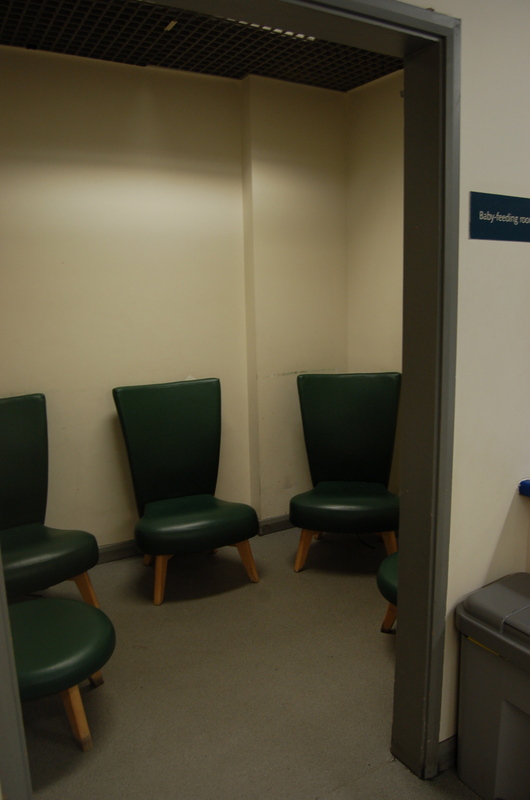 I’m delighted to see a dedicated space – some pictures on the scuffed walls, and arms on the chairs to help balance baby would make it near perfect. Remember there are steps to the museum via the main entrance – a step free route is available via the side entrance (Exhibition Road) but you must use a tiny and slow lift (possibly the smallest public lift I’ve ever seen in a national museum) and walk through a number of galleries to get there. Toddler time from gallery to toilets: Ah – not so good news. There are no toilets available on the lawn, so you need to use the ones inside the museum. On a good day (weekday, outside of school holidays) I’d say 5 minutes to get past bag checks and find your bearings. On a busy day (weekend or holidays) you’d need to leave up to 45 minutes-1 hour to queue to get into the museum. I can’t imagine a toddler waiting that long – you may find it quicker to use the V&A Museum toilets across the road. Nearest playground: It’s a 20-25 minutes pleasant walk to the Diana Memorial Playground – with a giant pirate ship set in a beach, it’s one of the best playgrounds in London. Food: There’s a number of eating options including a picnic area inside the museum, plus small sandwich and ice-cream vans on the East Lawn. I almost always make a trip to Oddono’s when in South Kensington to have one of the best ice-creams in London. There are a number of authentic French cafes on Bute Street too. Want to make more of a day of it? : You’re spoilt for choice. There’s several days worth of things to do and see within a stone’s throw – either inside the Natural History Museum proper, or at the nearby Science Museum or V&A Museum.